WIW part 2 (6 outfits)	Fussy Footed Ladies: SHOE FIND! Gimp, Sprinkles, & Comics - Shoe projects! 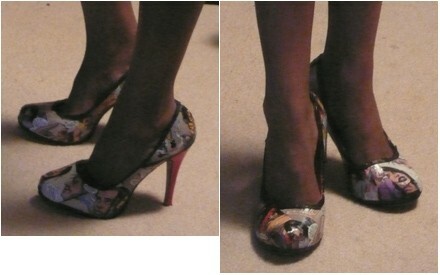 1 & 2 - I did these about a year ago, but do to fit problems with the (extremely cheap) shoe I've never actually worn them! I've glued red and blue gimp (that flat plastic ribbony stuff) to the bottoms using a glue gun. It was months after I finished the shoes that I finally thought 'hey, I should have just painted those.' Lyn* totally had the right idea to use nail polish. Alas. 3, 4, 5 - These are covered in nonpareils - the spherical sprinkles. 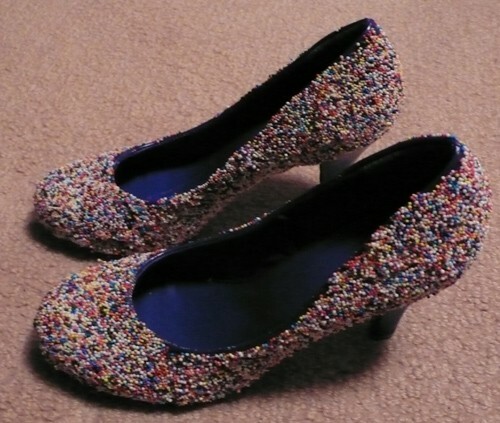 I covered the shoes in contact cement and dipped them in the sprinkles, then added the trim and abstract bow in licorice. I've worn them once so far and they held up really well. The original shoe is the same colour blue as the insole, which is awesome because I left the heel uncovered and the pop of blue looks great against the candy. 6, 7, 8 - These are Modge Podged and covered in a collage of comics (HackSlash). I added a black ribbon trim so it would seem more like comic book panels. I haven't worn these out yet - but I think they should hold up really well. Wow -- totally cool! Will you post a photo of how you style an outfit with these? I am totally making Tintin Boots. I'm crazy about the comix shoes. Wow, you are so creative! Love! Girl X, these are the fabbest shoes I've ever seen someone DIY. love love love the comix...so much inspiration. Very clever all of them. I want to bite into the candy ones! How on Earth did you cover the shoes by the comic?!?! April, I have a recent WIW with the candy shoes that I'll put up soon, but really I think they'll be easy to pair with anything - I tend to envision the candies and comics with dark skinnies. Lyn* you absolutely must make TinTin boots! But please don't destroy your TinTin comics - photocopy onto fax or tracing paper and use that instead. AlaskaGirl - Thanks! All three were super simple to do, just messy, sticky, and in the case of the gimp, really tedious. 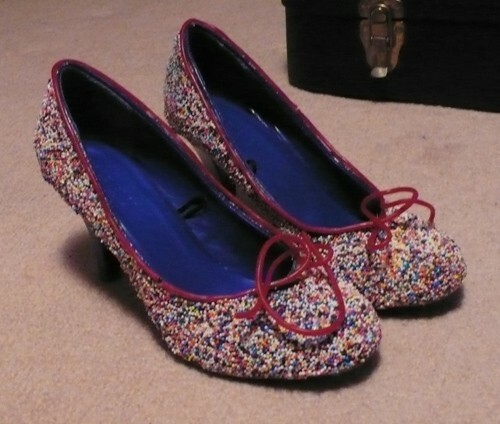 JJSloane - There will be no snacking on the candy shoes, they're sprayed with sealant so they're kind of toxic now! Girl X, you are SOOOOOO crafty and clever! Bravo! How fun/amazing/fabulous! You'll have to let us know how they hold up! I have a Tintin comic I bought at a Garage Sale that had a few pages missing (didn't know this at the time). I have since replaced the comic but I kept the other portion to make crafts! "You have gout, see here on my heel, this is a picture of a toe with gout." Those candy shoes look like cupcakes for the feet! So creative! I love the comic ones too. You did such a great job with the details. Did you spray the comic shoes to seal them after the Modge Podge dried? OMG, these are amazing! You should be a shoe designer. You better copyright these looks pretty quick before someone steals your genius. Yes, let's see outfits with them! Ornella - it's really just a collage. Modge Podge (craft glue that dries clear) and cut out comics, edged in ribbon. I think the ribbon really makes it though. Heather - they make me hungry too! I actually ate nearly the entire bag of licorice while I was making the shoes - it's just luck that I had a couple of strands left for the trim. Lyn*- yea for people who sell comics with missing pages! You're really just going to be making a collage on a weird surface - you'll put down a bunch of background filler (full panels), and then your nice foreground images on top (cut outs of people and word bubbles). If you really do this on a boot, try to wear the boot for a while first so you already have creases etc at the ankle, then you'll be able to press the comics into the crease, so later when you're walking you won't tear the collage. Also - please take tons of pictures! I didn't take enough in progress images and regret not having them. Joy, I used contact cement to glue the sprinkles on, then sealed with a clear spray. You are so creative and talented! I love them all. 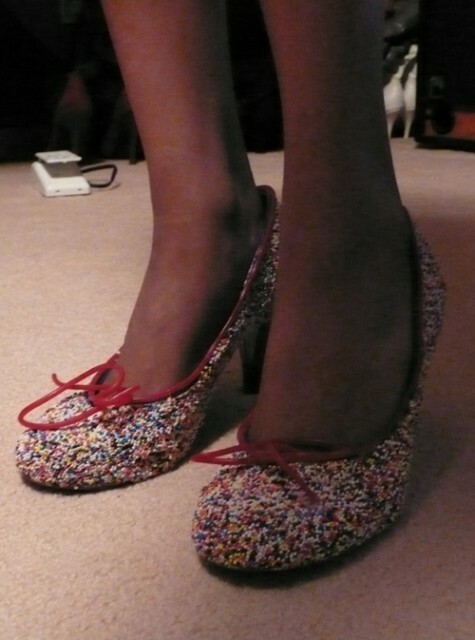 If I wore the sprinkles shoes, I think I would be hungry all day! Do you have a special cabinet setup for these jewels? So cool! I especially love the comic book ones. 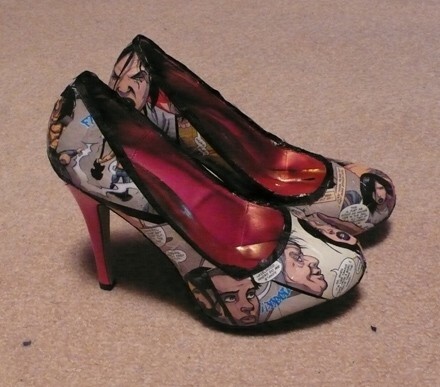 Ooh, I want a pair of comic shoes made from issue #1 of Models, Inc. So awesome! Those shoes are too fab for words. I am in awe of your creativity. They look amazing... And professionally done. Great Caesar's ghost Batman those are awesome! You'll have to do this with some of your own drawings!!! And the sprinkles make me think it's time for a double double at Tim Horton's! Excellent!--and don't forget your camera for a stepXstep!